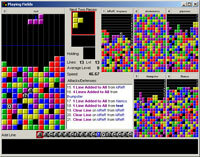 This is a game server and resource for TetriNET, which is a free online multiplayer version of Tetris. To get started you will need a TetriNET client, there are several available in the download section. Blocktrix is recommended for Windows users, as it has the best gameplay and is the most feature-rich client. After you have installed the client of your choice, connect to TetriNET.no or any of the other servers listed. It is also possible to play on WAN/LAN by using the server included in the 1.13, 1.14 and Blocktrix clients. If you are totally new to TetriNET it is strongly recommended that you read TETRINET.TXT, which also comes with the original client. It's time for the first Supa-Cup in almost a year. This will be a 1on1 pure tourney. It starts at 19:00 GMT, and will be played on Tetridome.com. See the Supa-Cup website for more information. After many years of betas Blocktrix 1.00 is finally here! With it's wealth of features and long development cycle Blocktrix is easily the best TetriNET client available. In Blocktrix 1.00 a handful of small problems were fixed, the most important being a tiny delay when using far left/right drop key after rotating a piece. Big thanks to StrikeLight for all the hours he spent contributing to the TetriNET scene!